Other names: Mexican husk tomato, husk tomato, jamberry, husk cherry, Mexican tomato, ground cherry, tomato, ground cherry. 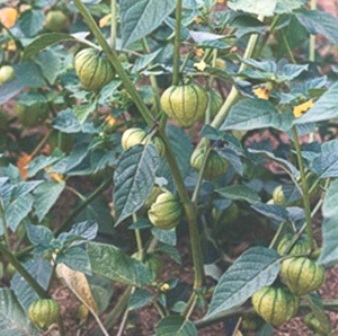 As indicated by the name, tomatillo is a close relative of tomato. It is believed to have originated in Central America. It is being grown and used as food in this region since thousands of years. Tomatillo travelled to other parts of the world too with time. Now it is also gown in Australia, South Africa and India and South East Asia. Tomatillois an annual, 15 to 60 cm tall, subglabrous, sometimes with sparse hairs on the stem: leaves 9-13 x 6-10 mm; apex acute to slightly acuminate, with irregularly dentate margins and two to six teeth on each side of the main tooth, of 3 to 8 mm; pedicel 5 to 10 mm. Calyx has ovate and hirsute lobules measuring 7-13 mm; corolla 8-32 mm wide, yellow and sometimes having faint greenish blue or purple spots; anthers blue or greenish blue. The calyx is accrescent, reaching 18-53 x 11-60 mm in the fruit, and has ten ribs. Fruit is 12-60 x 10-48 mm, developing inside green and purple bladder like calyx; unripe fruit slightly sticky on surface, 2.5-7.5 cm in dia, taste slightly sour and sweet, mildly tart and a distinctive pleasant flavour. Unripe fruits are cooked and used in curries, sauces, soups, stews etc. 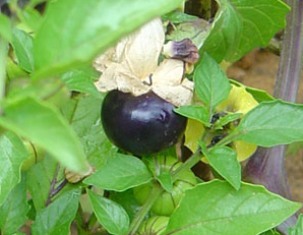 The fully ripe fruit is sweeter and can be eaten out of hand, added to salads or used in pies, preserves etc. 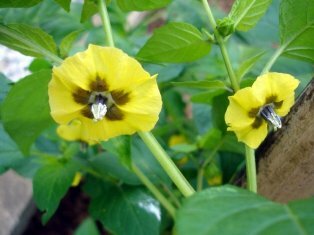 A very interesting feature of tomatillo fruit is that it can be stored for up to a year if picked before fully ripe and left inside their calyx. Tomatillo is grown more or less like tomato. It should be planted in well drained rich soil. Plants are raised from seed in the nursery and then transplanted to field after a few weeks. Several varieties are also available and choice can be made depending upon the location and market needs.